Helps maintain cardiovascular health. Helps support cognitive health / brain function. High intakes of EPA and DHA may help reduce the risk of age-related macular degeneration (AMD). Source of Omega-3 fatty acids for the maintenance of good health. Helps promote healthy mood balance. Helps support cognitive health / brain function of the mother and child. Helps support the development of the brain, eyes and nerves in the child. Enteric softgels to prevent fishy aftertaste. 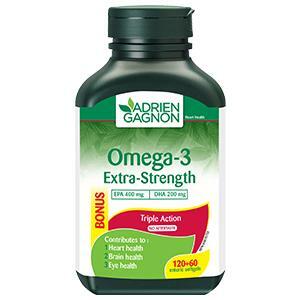 These softgels resist gastric acids and release the omega-3s inside the intestine. This property also ensures more omega-3 fatty acids reach the intestine intact for an optimal efficacy. A natural tangerine-lime flavour has been added to further reduce the risk of fishy aftertaste. Natural vitamin E (10 IU) ensures freshness by protecting the omega-3s from oxidation. Every Adrien Gagnon omega product is tested for more than 95 contaminants (heavy metals, bacteria, PCBs, pesticides, oxidation, etc.) and must pass strict pharmaceutical quality and purity standards.